Why is it important to teach creative writing? Creative writing is both a personal outlet as well as a diligent craft that one spends one’s life learning. Many creative writing teachers become mentors and trusted advisors to their students, who have gathered vital experiences in editing, publishing, and promoting their work. Some of my happiest days, as a creative writing instructor and professor, are when my fellow writers email me to celebrate their finished drafts or their latest publications. Creative writing teachers glean camaraderie and motivation from working with their students. It’s a win-win from both sides of the desk. Classes, workshops, and groups also offer something crucial to writers—deadlines for writing practice. How did you get into teaching creative writing? My trajectory into teaching creative writing began after grad school. At that point, I had tutored various levels of high-school English and history, primarily for English as a Second Language speakers and students with learning challenges, for eight years. I already enjoyed sharing my knowledge about writing and explaining complex ideas in more-direct, clear language. I couldn’t wait to expand my pedagogy to sharing my passion for creative writing with students who also shared my goals of writing fiction, poetry, creative nonfiction, and other genres, and building an audience through publication. Luckily for me, the internet boom in online education that continues still had kick-started around the same time as I earned my MFA. This was a tremendous and exciting opportunity. I applied and pitched my class ideas to various awesome creative writing schools for several months and was thrilled to accept Women on Writing (WOW) Women on Writing Classes that I still teach for to this day. I also am a creative writing professor online for Southern New Hampshire University’s MA program, where I love teaching a poetry thesis class and a course in publishing. Between all of my teaching and freelancing jobs, I am privileged to teach writers ages high school through 80+. My students have a wide range of personal and life experiences, come from all over the world, and are all motivated by a passion for the written word—this is my dream job, and I savor its variety. What creative writing exercise or prompt do you use that produces interesting results from writers? This is a fantastic question. I am a huge believer in the value of prompts, so much so that both of the creative writing texts I wrote have themed prompts at the end of each chapter. “Try this prompt: Construct a scene where two characters argue over something or someone.” I recommend beginning in the middle of the argument. Consider: What does each character not want? What does each character refuse to give up? What is the one piece of advice that you would give to new writers who are at the beginning stages of exploring their craft? Befriend a fellow writer and make a writing-accountability buddy. While we certainly can make a go of it alone, having a pal with similar goals that you meet for coffee and writing sessions in person or via email or Skype if you live far apart will not only encourage your latest project but also keep you from quitting when drafting and (later) submitting work become a slog. Where will you meet fellow writers? Try either joining a writing class online or in person, joining or forming a writing or book club group in your local community, or taking a writing challenge that has a website and coordinating message boards, like the National Novel Writing Month (NaNoWriMo) in which authors pledge to write a novel in 30 days each November. Any particular resource (website or book or anything) that you would recommend to writers? I would love to recommend two writing craft books I wrote, both published in 2018 by Vine Leaves Press: Poetry Power: An Interactive Guide for Writing, Editing, Teaching, and Reflecting on the Life Poetic and In a Flash: Writing & Publishing Dynamic Flash Prose. I am super excited to share my own writing journey of 25+ years with my fellow writers in these labor-of-love texts I wrote especially for my fellow authors. Both books are jam-packed with practical and helpful tips, advice, prompts, and anecdotes about this writing life, from spark of inspiration, through drafting, editing, submitting work, and publishing. They are available through my Etsy at WritePathProductions Melanie Faith – Write Path Productions as well as at Amazon. One great source of writing markets is https://www.pw.org/classifieds, which are updated every-other month and include magazines, anthologies, and other submission calls. Melanie Faith is a poet, fictionista, essayist, professor, and photographer. Melanie collects quotes, books, and twinkly costume-jewelry brooches. 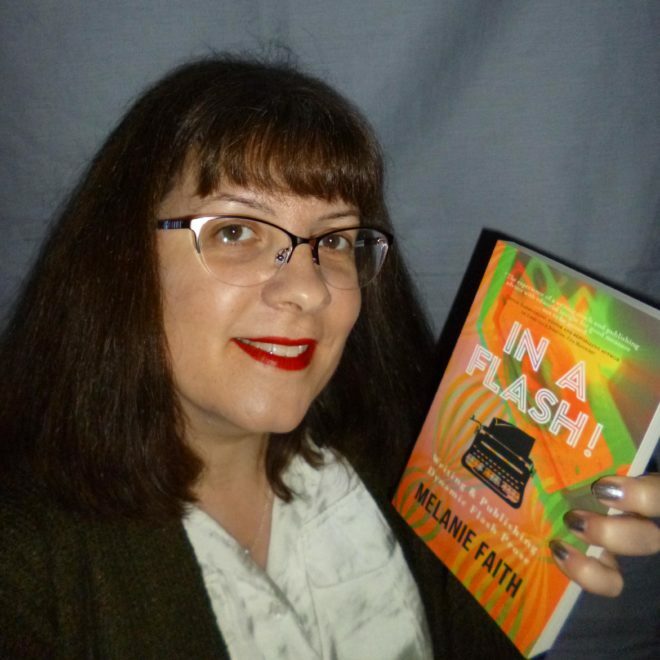 She wrote a craft book about the flash genre to inspire fellow writers, In a Flash! : Writing & Publishing Dynamic Flash Prose (Vine Leaves Press, April 2018), and a poetry writing text, Poetry Power, (Vine Leaves Press, October 2018). Her short stories were published in Red Coyote (Fall 2018) and SunLit Fiction (October 2018). Her poetry most recently appeared in Up North Lit (October 2018) and Meniscus (Fall 2018). Her historical poetry collection, This Passing Fever, was published by FutureCycle Press in 2017. Fantastic advice for writers, Melanie. It’s wonderful to hear how much you enjoy teaching this beautiful craft. You’ve helped so many of us find our path! PS: your resource book shelf and mine are identical 😊.